The launch of the EDGE Reptiles list earlier this year introduced the world to some seriously strange creatures, from the green-fro-rocking Mary River punk turtle to the squashed-looking Cantor’s softshell turtle. Not to be outshone, the EDGE Sharks & Rays list features some incredible species, from the beautiful to the deadly to the downright weird. Here, the EDGE of Existence Programme’s resident Marine Biologist, Fran Cabada, picks her top 10 most weird and wonderful EDGE Sharks & Rays! This amazing flat shark is so effective at camouflaging itself to ambush prey that it requires a trained eye to spot it when diving. This species is the only angel shark to occur in the British Isles. Over the past century, angel shark populations have fallen dramatically, mainly because it is highly susceptible to being accidentally caught in trawl nets. Because angel sharks like to occupy inshore marine habitats with sandy bottoms, human disturbance and degradation of these habitats also pose a threat. Thankfully, the Angel Shark Project is uniting NGO organisations and researchers to work towards conserving this marvelous EDGE shark. Click here to learn more about this species. Sawfish have been around for over 100 million years, so it is little surprise that the number one ranked EDGE species of all time is a sawfish! Sawfish are one of the most unique-looking rays of the world, mainly due to the saw-like “rostrum” protruding from their face. I find this species to be fascinating beyond just its looks, because it can live in both marine and freshwater habitats; it is an eurihaline species. One sub-population was even found to inhabit Lake Nicaragua! Sadly, sawfishes are a highly threatened family of rays. Their saw and skin have been sought after for centuries; Ancient Mayas were buried with sawfish teeth and cowboy boots were once made with sawfish skin. While the largetooth sawfish was once common throughout its range, it is now limited to four subpopulations within the tropics. African wedgefishes can grow to be as large as a family-sized car! Also called ‘guitarfishes’ for their peculiarly-shaped bodies, the African wedgefish is known by a number of different names worldwide. This can actually lead to confusion and hamper conservation efforts. A very elusive species, few pictures of living individuals of African wedgefish have ever been taken. They occur on the West coast of Africa and their habitat is subject to intense fishing activities, including trawl fishing. This is the most pressing threat to this species which, as a close relative of sawfish, shares many of the features and traits that caused the sawfish population to nosedive. The largest of the whiptail stingrays, when swimming, this giant resembles a flying magic carpet. 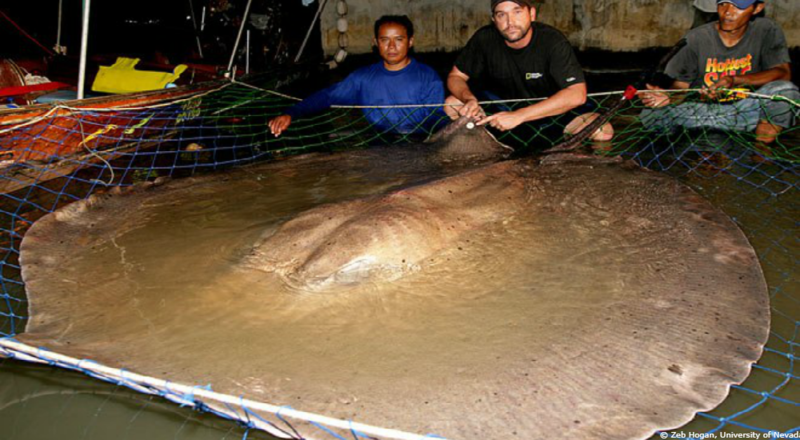 The massive size of this true river monster is really something to behold! It can usually be seen feeding near the shores of rivers. As they only give birth to one pup, recovery from population decline is very difficult for this species. Living in large rivers, habitat degradation is a major threat. Looking as if its always surprised, the most salient feature of the pelagic thresher’s highly hydrodynamic body are not its eyes, but the very long upper part of its caudal fin. This extra-long fin is used to stun small fishes. What a clever way to grab a bite! The pelagic thresher shark is, as its name suggests, a pelagic species – meaning that it lives in the pelagic zone of ocean waters, being neither close to the bottom nor near the shore. This is in contrast with demersal fish, which d o live on or near the bottom, and reef fish, which are associated with coral reefs. Although its popularity has increased due to the SCUBA diving industry in the Philippines, very little is known about the pelagic thresher shark. Wearing spikes like a helmet, this bad-boy looking guitarfish is, to me, the epitome of guitarfishes: they look rays on the front and sharks at the back. Maybe that is why it is also known as the ray shark! The bowmouth guitarfish is a basal species, appearing as one of the first representatives of the family Rhinobatidae, some 85 million years ago. Within the Asian fin market, the fins of this species reach high prices which generates a big demand and makes fisheries the main threat for its conservation. The eagle rays split as a family from the rest of the rays some 128 million years ago, the ornate eagle being one of the biggest. A very elusive and uncommon species, this beautiful eagle ray is just majestic. They are very strong swimmers and breach the water surface, jumping into the air as if in a playful dance. It has been traditionally used for its cartilage and its meat is also consumed, reaching a medium value on fish markets. Sadly, no conservation measures have been put in place to secure the future of this wonderful eagle ray. This rare houndshark is the only representative of its genus. Its meat is part of the folk cuisine of the Spanish region of Andalucia, where it is called cazon. This term is frequently used in other Spanish-speaking countries to refer to any type of shark meat. In the early 20th century it was targeted by large scale fisheries due to the high vitamin A oil content of its liver. Although many of these fisheries stopped targeting the toper shark after its population decline, it still is a significant part of some Australian commercial fisheries. The sand shark split from its closest relatives a little more than 100 million years ago, being the only still-living species of its genus. The scary-looking smile of the sand shark is something of a trademark of its family, as it is also shared by the great white and the mako. Though they may have a fearsome look, the sand shark is a placid, slow-moving shark. They are so lazy that they gulp air from the surface and hold it in their stomachs, which allows them to float motionlessly in the water to save energy and watch for prey. This is just a glimpse of the true wonder of EDGE Sharks & Rays. To view the entire Top 50, click here!